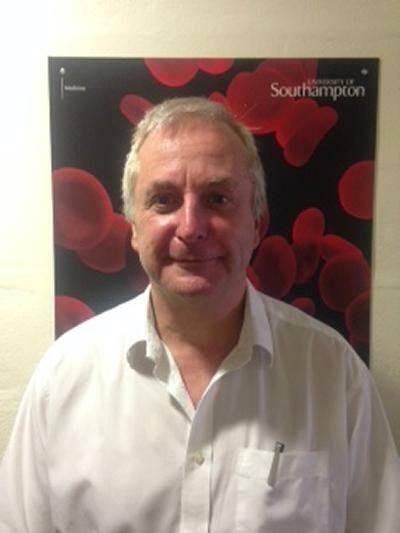 Professor Clive Holmes is Professor of Biological Psychiatry within Medicine at the University of Southampton with a focus on research on the biological factors that alter the clinical course of Alzheimer’s Disease and other related chronic neurodegenerative conditions but with a focus on the role of inflammation. This includes a better understanding of the factors that determine the rate of cognitive decline and the development of neuropsychiatric features. Professor Holmes also leads a clinical trials unit that examines the effects of pharmacological interventions of patients with Alzheimer’s Disease and related conditions. He has had a key role in developing a better understanding of immunomodulatory drugs in Alzheimer’s Disease including the role of drugs such as Etanercept that target systemic innate immunity. "This is a good example of research implicating a mechanism in the disease– in this case systemic inflammation– narrowing down a potential target and using a compound against that target to test a hypothesis”. Dr Eric Karran the director of research at the Alzheimer’s Research UK talking of Prof Holmes work. Professor Clive Holmes was appointed to the Chair of Biological Psychiatry in 2005. He graduated with a first class honours degree in biology from the University of Sussex in 1981 and then went on to study medicine at the University of Leicester; graduating in 1987. He trained in general psychiatry at Guy’s Hospital, London with a two year additional placement as a visiting research fellow in Neurochemistry at the Institute of Neurology, London. Following this placement he undertook higher training as a Lecturer in Old Age Psychiatry at the Institute of Psychiatry before completing his PhD on the genetics of the neuropsychiatric features of Alzheimer’s Disease in 2001. He held a post as a Senior Lecturer in Old Age Psychiatry at the University of Southampton before being promoted to his current appointment. He is an honorary consultant in Old Age Psychiatry at Southern Health Foundation Trust. BSc, Biology , University of Sussex (1981). M.B.,ChB, Medicine, University of Leicester (1987). Visiting research fellow. Institute of Neurology, London (1991-3). Lecturer in Old Age Psychiatry. Institute of Psychiatry, London (1994-8). Professor Holmes’s clinical research programme consists of translational research that falls under 3 main themes. In Alzheimer’s disease brain pathology is accompanied by an inflammatory response, neuroinflammation, characterized by activation of microglia. Work performed in Southampton on an animal model of chronic neurodegeneration showed that systemic inflammation (i.e. inflammation outside the CNS) led to an exaggeration of the symptoms of sickness behaviour, and an acceleration of CNS disease progression. This work led to the hypothesis that microglia in the diseased brain are ‘primed’ by ongoing neurodegenerative disease and are more susceptible to peripheral signals from ongoing systemic inflammation with further activation of the microglia contributing to disease onset and progression (Perry et al 2007). Clinical studies performed by Prof Holmes in Southampton have confirmed this. An cohort study of Alzheimer’s disease subjects showed that those with systemic inflammation, associated with a raised peripheral pro-inflammatory cytokine signal, had a more rapid long term cognitive decline and exaggerated sickness behaviour symptoms (Holmes et al, 2009; 2011). This finding, in conjunction with collaborative genome wide association studies (Harold et al 2009) identifying the importance of innate immunity in late onset AD, has important implications for our understanding of the factors that drive disease progression and to the development of new treatments. Further research by Prof Holmes is exploring the role of specific common inflammatory events e.g. chronic periodontitis; respiratory and urinary infections on disease progression; the effects of systemic drug therapies, aimed at attenuating the systemic pro-inflammatory cytokine signal, on disease progression and the development of a clinical sickness behaviour scale. Our primary goal is to discover how we can monitor, prevent and inhibit the detrimental effects of a systemic inflammatory event on the diseased brain. Studies in animal models suggested that peripheral immunisation with Aβ protein may reduce brain Aβ. The first human clinical study (Bayer et al 2005) to explore the safety of Aβ immunotherapy in Alzheimer ’s disease was performed in our clinical trials unit the Memory Assessment and Research Centre in Southampton. Neuropathological examination of a single case from this cohort was the first study to demonstrate that Aβ immunization alters Alzheimer’s disease by removing Aβ plaques from the brain (Nicoll et al 2003). In 2006 this finding was identified by 34 leaders in the field as one of the most notable advances in Alzheimer’s Disease (Nature Medicine 2006) and has being quoted as the most highly cited case report in medicine (BMJ 2009). This finding has had a major impact on the development of new vaccination therapies by pharmaceutical companies. At the time the initial active immunisation protocol was halted due to unanticipated side effects. However, our observation that immunisation had indeed resulted in plaque removal was instrumental in encouraging several pharmaceutical companies to continue with programmes, that they had been about to abandon. Professor Holmes established an independent long term clinico-neuropathological follow up study of the whole cohort with the co-operation of Elan Pharmaceuticals who provided unpublished data on treatment allocation and baseline antibody response. This has led to joint publications with industry (Nicoll et al 2005) and a highly cited Lancet study (Holmes et al 2008) showing the variable nature of Aβ plaque removal from the brain and, most importantly, that Aβ plaque removal was not sufficient to halt the cognitive decline. This finding has directly challenged the dominant pathogenetic hypothesis of AD; the amyloid cascade hypothesis; and clearly suggests that removing plaques late in the disease will not give benefits. Further work has elucidated the impact of A immunisation on other aspects of neuropathology including the possible side effects of immunotherapy e.g. on vascular pathology (Boche et al 2008); its impact on innate immunity (Boche and Nicoll 2008; Zotova et al 2010) and the effects on tau pathology (Boche at al 2010). Work is continuing to further explore the biological and clinical consequences of vaccination with ongoing pharmaceutical trials in our clinical trials unit and further neuropathological examination of immunized cases in the department of neuropathology. Professor Holmes has had a long standing interest in the treatment of cognitive and behavioural symptoms in Alzheimer’s disease and, in addition to immunomodulatory therapies, has performed a large number of RPCT trials in other pharmaceutical areas over the past 10 years. This has included a number of investigator initiated commercially funded studies examining the effects of cholinesterase inhibitors and neuroleptics on disease progression in Alzheimer’s Disease as well as major non pharmaceutically funded national collaborative RPCT’s. Recent examples include an MRC study (CALM-AD) examining the role of a cholinesterase inhibitor in the treatment of agitation in Alzheimer’s disease; a NIHR Study (SADD) examining the treatment of depression with anti-depressants in dementia and an MRC study (DOMINO) examining the treatment of dementia with a cholinesterase inhibitor and memantine. These studies have led to major publications in the NEJM and the Lancet. NIHR South Coast DeNDRON lead for dementia. NIHR board member of dementia clinical studies group. NIHR board member of dementia portfolio adoption committee. Alzheimer’s Research UK, Scientific advisory board member. Alzheimer's Society, Scientific advisory board member. Department of Health advisor on Dementia. Nicoll, J., Buckland, G., Harrison, C., Page, A., Harris, S., Love, S., ... Boche, D. (Accepted/In press). Persistent neuropathological effects 14 years following amyloid-β immunisation in Alzheimer’s disease. Brain, [BRAIN-2018-01483.R2]. Huang, L., Abuhamdah, S., Howes, M-J. R., Dixon, C. L., Elliot, M. S. J., Ballard, C., ... Chazot, P. L. (2009). Pharmacological profile of essential oils derived from Lavandula angustifolia and Melissa officinalis with anti-agitation properties: focus on ligand-gated channels. Journal of Pharmacy and Pharmacology, 61(2), 267. Holmes, C., & Cotterell, D. (2009). Role of infection in the pathogenesis of Alzheimer's disease: implications for treatment. CNS drugs, 23(12), 993-1002. Howard, R. J., Juszczak, E., Ballard, C. G., Bentham, P., Brown, R. G., Bullock, R., ... Rodger, M. (2007). Donepezil for the treatment of agitation in Alzheimer's disease. New England Journal of Medicine, 357(14), 1382-1392. Kemp, P. M., & Holmes, C. (2007). Imaging in dementia with Lewy bodies: a review. Nuclear Medicine Communications, 28(7), 511-519. Kemp, P. M., Hoffmann, S. A., Tossici-Bolt, L., Fleming, J. S., & Holmes, C. (2007). Limitations of the HMPAO SPECT appearances of occipital lobe perfusion in the differential diagnosis of dementia with Lewy bodies. Nuclear Medicine Communications, 28(6), 451-456. Smith, T., Gildeh, N., & Holmes, C. (2007). The Montreal Cognitive Assessment: validity and utility in a memory clinic setting. Canadian Journal of Psychiatry, 52(5), 329-332. Nicoll, JAR., Barton, E., Boche, D., Neal, JW., Ferrer, I., Thompson, P., ... Holmes, C. (2006). Abeta species removal after Abeta42 immunization. Journal of Neuropathology & Experimental Neurology, 65(11), 1040-1048. Dunn, N., Mullee, M., Perry, V. H., & Holmes, C. (2005). Association between dementia and infectious disease: evidence from a case-control study. Alzheimer Disease and Associated Disorders, 19(2), 91-94. Dunn, N., Holmes, C., & Mullee, M. (2005). Does lithium therapy protect against the onset of dementia. Alzheimer Disease and Associated Disorders, 19(1), 20-22. Kemp, P. M., Hoffmann, S. A., Holmes, C., Bolt, L., Ward, T., Holmes, R. B., & Fleming, J. S. (2005). The contribution of statistical parametric mapping in the assessment of precuneal and medial temporal lobe perfusion by 99mTc-HMPAO SPECT in mild Alzheimer's and Lewy body dementia. Nuclear Medicine Communications, 26(12), 1099-1106. Holmes, C., Wilkinson, D., Dean, C., Vethanayagam, S., Olivieri, S., Langley, A. N. D., ... Damms, J. (2004). The efficacy of donepezil in the treatment of neuropsychiatric symptoms in Alzheimer disease. Neurology, 63(2), 214-219. Kemp, P. M., Holmes, C., Hoffmann, S. M. A., Bolt, L., Holmes, R., Rowden, J., & Fleming, J. S. (2003). Alzheimer's disease: differences in technetium-99m HMPAO SPECT scan findings between early onset and late onset dementia. Journal of Neurology Neurosurgery and Psychiatry, 74(6), 715-719. Holmes, C., & Lovestone, S. (2003). Long-term cognitive and functional decline in late onset Alzheimer's disease: therapeutic implications. Age and Ageing, 32(2), 200-204. Holmes, C. (2002). Genetics of Down's Syndome and Alzheimer's disease: author's reply. The British Journal of Psychiatry, 181, 167-168. Holmes, C. (2002). Genotype and phenotype in Alzheimer's disease. British Journal of Psychiatry, 180, 131-134. Burns, A., Byrne, J., Ballard, C., & Holmes, C. (2002). Sensory stimluation in dementia. BMJ, 325(7379), 1312-1313. Holmes, C., Smith, H. R., Arranz, M., Collier, D., Powell, J., & Lovestone, S. (2001). Psychosis and aggression in Alzheimer's disease: the effect of dopamine receptor gene variation. Journal of Neurology Neurosurgery and Psychiatry, 71(6), 777-779. Holmes, C. (2008). The genetics and molecular biology of dementia. In R. Jacoby, C. Robin, T. Dening, & T. Alan (Eds. ), Oxford Textbook of Old Age Psychiatry (pp. 103-118). Oxford, UK: Oxford University Press.